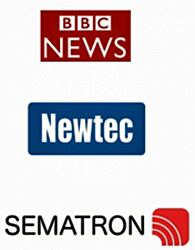 Newtec has announced that their Newtec Dialog® multiservice platform is being used by BBC News for the company's provision of IP connectivity over satellite. Newtec Dialog will allow the BBC’s news team to deploy mobile solutions capable of transmitting video, voice, files and general broadband services. A single multiservice communication link will be deployed, leveraging the power of All-IP. 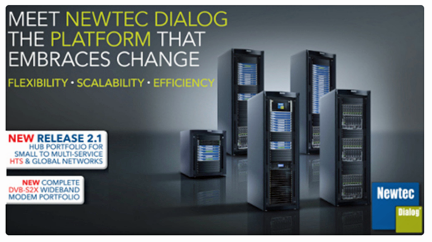 The Newtec Dialog platform provided, features the award-winning return link technology Mx-DMA®, which delivers the efficiency of SCPC with the dynamic bandwidth allocation of MF-TDMA. This allows BBC News to flexibly and seamlessly manage bandwidth, while avoiding the fragmentation of space segment. Newtec Dialog’s multilevel Quality of Service (QoS) model allows the user to manage QoS in the VSAT forward and return links with the same flexibility as it can with terrestrial networks and provide service level agreement guarantees across the population for different services, in difficult weather and operational conditions. The remote terminals will be equipped with the MDM3300 Satellite Modem, providing a lightweight, compact and cost-effective solution which also allows integration into ruggedized enclosures, with bitrates in the return link that can reach 21 Mbps multicast. The design and installation for the BBC is being coordinated by a multi-national team comprising of engineers from BBC, Newtec and the firm's certified U.K. business partner Sematron, strengthening and expanding the knowledge and expertise throughout the companies’ networks to provide the best solution for BBC’s needs. 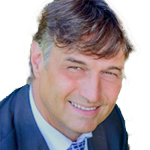 Hans Mssart, Newtec's Market Director Broadcast. Hans Massart, Newtec’s Market Director Broadcast, said that the possibility for BBC News to choose ad hoc from a combination of satellite, cellular, Wi-Fi or Ethernet IP connectivity provides them with more tools to establish a flexible, reliable and cost-effective way to deliver more content from more locations and vantage points. In certain situations, IP satellite may be the only connectivity option left to field crews when terrestrial networks are not available, become contended over time, suffer from too much jitter or are not cost-effective.